“Members of the BLET’s Safety Task Force are on the scene assisting the National Transportation Safety Board (NTSB) with the investigation into the tragic December 18 derailment of an Amtrak train in Washington State. As part of our Party Status agreement with the NTSB, the BLET does not make official comments about the details of any ongoing accident investigation, nor does BLET speculate on the events that may have contributed to such an accident during the investigation. Any current or former BLET members who chose to comment on this event do not speak for, or represent our Brotherhood or its members. All media inquiries should be directed to the NTSB, and the NTSB will handle release of details regarding this accident as the on-site investigation unfolds. “Those who were hurt in the accident and the loved ones of those who lost their lives deserve to know what happened based upon the facts that are uncovered; sharing speculation based upon personal opinions about the events under investigation does them all a disservice. “The BLET Safety Task Force (STF) assists federal agencies in the investigation of rail accidents, helping to determine probable causes and making safety recommendations. The STF will study this accident from the viewpoint of locomotive engineers and trainmen to help determine how the accident occurred and how to prevent similar accidents from happening in the future. 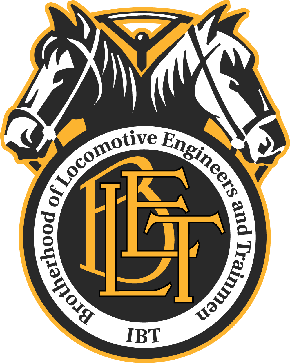 The Brotherhood of Locomotive Engineers and Trainmen (BLET) represents more than 57,000 professional locomotive engineers and trainmen throughout the United States. The BLET is the founding member of the Rail Conference, International Brotherhood of Teamsters.